Power has always been an issue for me in the car. This is becoming more of a problem with the advent of MP3 players, iPad and iPhone, not to mention portable DVD players to keep the passengers quiet. This is often compounded by having just a single power outlet in a car requiring switching of plugs to keep things topped up on long journeys. Even worse is the differing power requirements the the iPad has!!! 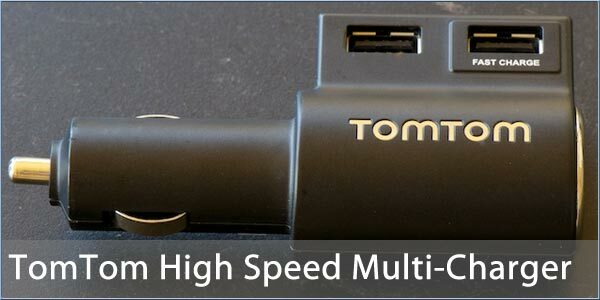 TomTom have solved these issues somewhat with the TomTom High Speed Multi-Charger. This compact accessory is just a little larger than the TomTom power supplies for the iPhone cradle. 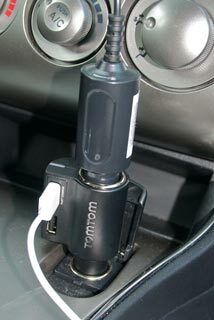 The Multi-Charger has a pass-through accessory socket and 2 USB sockets on it. One USB socket provides a non-standard 1.2 amp power USB connector (standard is 500 mA), whilst the other provides a thumping 2.1 amps (or 10 Watts) required for the iPad. 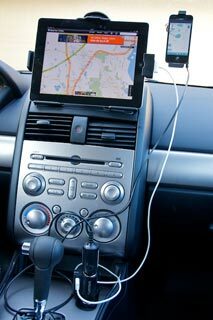 One of the big issues with trying to use the iPad as a navigation device on a road trip was keeping the charge up. Using a standard charger sees the iPad battery gradually deplete. I have also used some other third party chargers that claimed to be iPad compatible, but either did not manage to keep the charge up, or just plain didn't work at all. It was with great pleasure that I took my iPhone, iPad and GO940 into the car in various states of charge plugged them all in and set of on a 2 hour trip to find all 3 devices working perfectly and getting charged as I was driving. Note the iPhone is only that high on the windscreen for illustrative purposes. Always ensure your field of view is clear when driving. In fact the setup worked so well that I decided to put it to a serious test. The objective was to use my iPad and phone for a whole week without connecting them to the computer other than to provide sync services between the devices. I was out in Florida covering the Space Shuttle Endeavour STS-134 launch from the Kennedy Space Center. The Space Center is just over an hours drive from the house I was staying at, this meant that the iPhone and iPad would get 2 hours charge a day. I was using the iPad extensively on twitter, Facebook and believe it or not actually Skypeing with video from the Space Shuttle launch pad, using hefty amounts of my 2Gb AT&T data allowance. I was also using Skype extensively on my iPhone to call home. Of course I was also tuned in to NASA TV to find out what was going on chewing up even more power. If you need to power an iPad in the car then I whole-heartedly recommend the TomTom High Speed Multi-Charger, which at £20 may seem quite steep but is well worth it. Perhaps a silly question, but will the non-standard current damage 'normal' devices that are only looking for 500mA? Also, High Speed seems to be a bit of a misnomer, surely 'High Power' would be better? This looks like a useful thingy - when I got the usual email from TT I naturally junked it immediately for spam, but now your review makes a whole difference. Effectively looks like it gives me three plug'oles instead of one - it would charge/power three TT devices, one via the pass through thing and two using their USB cables, right? (Actually I have four plug'oles already and that's not enough). Please may I put in a supplementary question? I rang Apple this week. Told them I'm going on holiday and we have three devices, iPhone 3GS, iPad 1 and iPad 2. On my desk here I have therefore three cables. I asked if I could take just one and the man said NO. The justification now seems to hinge on the iPad 2 needing higher rated power. But if Mike's right (and I tend to believe him) that devices only take what they require, that indicates I could just take the 10 Watts plug'ole and cable. Tell me that's right please and I can save spaghetti space? I have no problem charging my iPad2 or iPhone from the new TomTom unit - and it's the only thing that make a worthwhile charge to my smartphones when driving home and talking handsfree on the phone - my standard charger would end the call with a lower battery than when I started. So works perfectly... now just need a big solar panel for the roof the car! But if Mike's right (and I tend to believe him) that devices only take what they require, that indicates I could just take the 10 Watts plug'ole and cable. Tell me that's right please and I can save spaghetti space? I am assuming you mean the 'other' Mike... I may be cavalier but when I travel I only take the 10w Apple Brick with me. I never take any other charger unless you count my laptop, but then I dont always take that. I recently got one of these for less than £2, works a treat! Bargain! Free delivery too... worth getting a few not put in the top draw and never use at that price!!! I have just read a review that says the 2.1 amp connection is only compatible with Apple devices. Connecting non-apple devices only provides them with a max of 500mA. This may explain why my Go550 needs a long period of charging after a journey, I'd thought it should be fully charged with that level of power available. Recalled seeing this recently when browsing. No info on effectiveness etc. Yes one of the reviews here makes the point I was referring to. I bought a TT multi charger just before my last trip to Spain. The idea behind it was twofold. First was to keep the weight down when travelling with Ryanair who seem to have got much stricter on what size/weight your hand luggage can be, and secondly to enable me to keep my xl charged (with its shocking battery life) whilst recharging both our phones between geocaches where we were giving then some heavy usage for paperless caching with GPS and screen turned on for quite a long period of time.. We also had a Garmin 60XSx with us also for caching, but batteries in this can last a good couple of days in a charge. I found the only downside I found so far was the car we had was an Opel Astra, and the positioning of the 12v charger meant 3rd gear got in the way of charging all my devices! Not a problem in my Skodas where the 12v is next to the hand brake.